Sound waves are pressure waves travelling through a medium. We are most familiar with sound waves travelling through air, but sound waves also propagate through water, even through solids. A sound waves is made up of a sequence of alternating compressed and rarefied regions of the medium it is travelling through. 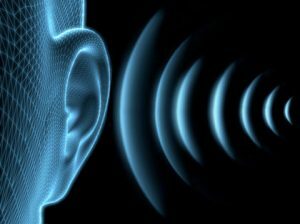 A “middle A” has a frequency of 440 Hertz, which means that every second 440 of these waves hit your eardrum. Sound waves, however, are not the only types of waves that we know of. Some examples of waves that are not sound waves are: ocean waves, gravitational waves, and electromagnetic waves. Of these the first requires a medium, just like sound waves. Ocean waves travel on water. (It wouldn’t make sense to talk about an ocean wave in space!) But not all waves require a medium to travel through. Electromagnetic waves are one example of these types. Electromagnetic waves are oscillations in electric and magnetic fields. Electric (E) and magnetic (B) fields can permeate space without a medium to support them. This is strange but true — electromagnetic fields can exist in a vacuum. It’s true that E- and B-field can penetrate things such as air, water, or brick walls, but these materials are not necessary for electromagnetic waves. What are some example of electromagnetic waves? Well, light is one example. Blue light has a frequency of roughly 700 TeraHertz. What this means is that every second the E- and B-field oscillates about 700 trillion times. Movies have suggested that any alien species from other planets or faraway moons are likely to look like this. Scientists, however, suspect that we are more likely to encounter one-celled species able to survive harsh environments. 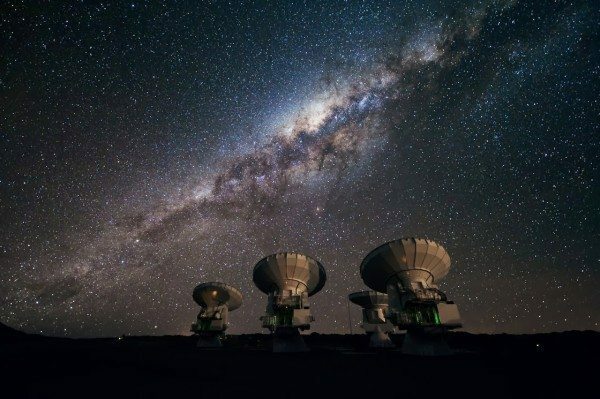 We know that electromagnetic waves can propagate through a vacuum because we can see planets and stars at night time. 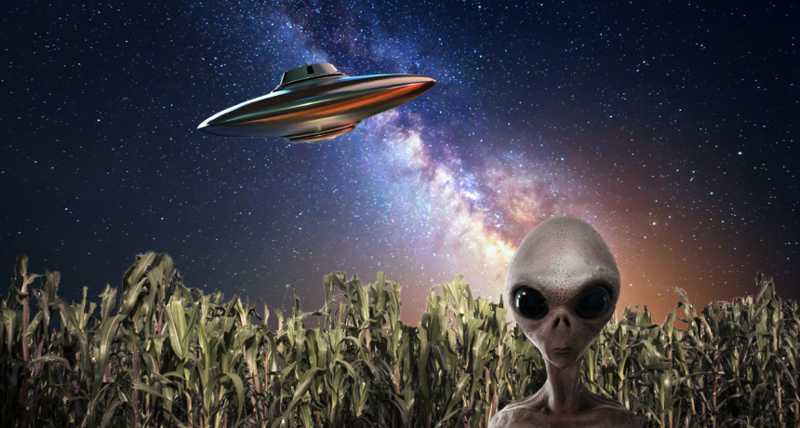 The light originating from far away stars had to travel through interstellar space, which is a vacuum, for many years before it reached our eyes or telescopes here on Earth. Now radio waves are just another form of electromagnetic radiation. To be more precise, radio waves are just “light” with a much smaller frequency. When you listen to FM radio, you’re tuning in stations that are being broadcast at anywhere from 88 to 108 MegaHertz. So this means that the E- and B-fields are oscillating 88 to 108 million times a second. That’s still awefully fast, but much slower than optical light. So, here’s the summary. Sound waves can’t travel through space, because they require a medium to carry along the compressions and rarefactions. Electromagnetic waves, however, of which radio waves are one example, can travel through space because they are made up of oscillations of electric and magnetic fields which have no problem permeating a vacuum. So, if E.T. tried to send a sound wave to us using a giant speaker, nothing would happen. There is no material in space to carry the sound wave! But if E.T. sent a radio wave, it could travel across all of space toward us. This is why searches for extraterrestrial life use radio waves.